In 1979, while people celebrated the Shah’s demise in Tehran, Zbigniew Brzezinski was on his way to Kuwait City for a meeting with Kuwaiti Emir Jaber al-Sabah, Saudi officials and Iraqi President Saddam Hussein. It was agreed that Hussein’s Republican Guard would invade oil-rich Khuzistan and amputate it from the rest of Iran. Oil prices had just begun to stabilize when Iraq launched its first salvo, sending spot futures through the roof. 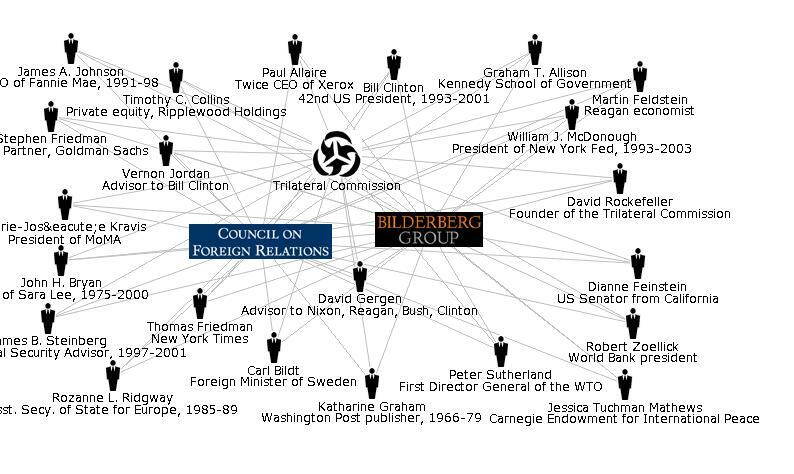 Brzezinski co-founded the Trilateral Commission (TC) in 1973 with David Rockefeller. The concept was hatched at the Rockefeller Pocantico Hills, NY estate in July 1972. Rockefeller served as the group’s first chairman. One of its largest financial supporters is the Rockefeller Brothers Fund. All eight North American representatives present at the founding meeting were also members of the secretive Council on Foreign Relations (CFR). The stated purpose of TC was to form a triad of global influence consisting of North America, Western Europe and Japan. The TC published The Crisis of Democracy in 1975. One of its authors, Harvard professor Samuel P. Huntington, is a prominent writer for the CFR publication Foreign Affairs. Huntington, intellectual darling of the global elite, argued that America needed “a greater degree of moderation in democracy”. The TC paper suggested that leaders with “expertise, seniority, experience and special talents” were needed to “override the claims of democracy”. More recently Huntington has been pushing his “Clash of Civilizations” thesis, which argues that war between the West and Islamic nations is inevitable. Samuel P. Huntington, intellectual darling of the global elite, argued that America needed “a greater degree of moderation in democracy”. The TC paper suggested that leaders with “expertise, seniority, experience and special talents” were needed to “override the claims of democracy”. Brzezinski was the architect of the concept of “rapid reaction forces”, which he argued the US now needed to police the Persian Gulf region in the absence of a friendly Iran. President Carter made clear in his 1980 State of the Union speech that he would not hesitate to use Brzezinski’s brainchild in the Gulf region, warning “An attempt by any outside force to gain control of the Persian Gulf region will be regarded as an assault on the vital interests of the United States, and such an attempt will be repelled by any means necessary, including military force.” Carter made good on his threat that same year when he used a rapid reaction Delta Force to attempt a helicopter rescue of the Iranian hostages in an ill-fated operation known as Desert One. Barbara Honeger, author of October Surprise, which details the 1980 conspiracy by the Reagan Presidential Campaign to sabotage Carter’s attempts to free the hostages, was at Desert One the day the US Cobra helicopter which was part of the Delta Force mission crashed, killing dozens of US military personnel. Honeger swears she saw a disc-shaped anti-gravity craft also carrying Delta Force personnel and that both the disc and the helicopter exploded in the air before they crashed. The mission commander was Major General Richard Secord. Former Federal Reserve Chairman Paul Volcker is current Chairman of the Trilateral Commission. Current Fed Chairman Allen Greenspan is a member of the TC as were Clinton Administration officials William Cohen, Bruce Babbitt, Strobe Talbott, Stephen Bosworth, Donna Shalala and Thomas Foley. Clinton himself was a member while Vice-President Gore was a CFR member. During the 1980 presidential campaign Ronald Reagan blasted Trilateral Commission influence over both the Carter White House and the rival Bush campaign, vowing to investigate the TC if elected. Reagan won the election. On March 30, 1981 he was shot by John Hinckley Jr.
During the 1980 presidential campaign Ronald Reagan blasted Trilateral Commission influence over both the Carter White House and the rival Bush campaign, vowing to investigate the TC if elected. Reagan won the election. On March 30, 1981 he was shot by John Hinckley Jr.
John Hinckley had been arrested on weapons charges in Nashville in 1977 when President Carter happened to be in town. But Hinckley walked and wasn’t even put on an FBI watch list. The day he shot Reagan, a mysterious woman made several calls to Hinckley’s hotel room. The Sunday night before Reagan was shot, Vice President George Bush Sr., who would have taken over as President had Reagan died, addressed the TC. Reagan, for his part, never mentioned the Trilateral Commission again. When President George Bush Jr. took office he began threatening the Iranians again, branding them, along with Iraq and North Korea, part of an “axis of evil”. In 2003 the US invaded Iraq. By 2007, already bogged down in a powerful Iraqi insurgency, the US sent an extra aircraft carrier group to the Persian Gulf as it ratcheted up its bellicose rhetoric towards Iran.